Oss, November, 02, 2018 – Kinase inhibitors illustrate the successful translation of basic scientific knowledge of cancer into new targeted therapies. Selecting the right patient population based on the occurrence of specific cancer driver events is key. In a new study, which appeared online today in the journal Molecular Cancer Therapeutics from the American Association of Cancer Research (AACR), Uitdehaag et al. describe the discovery of new predictive drug response biomarkers for seventeen approved kinase inhibitors . The biomarkers are either mutations in cancer driver genes (oncogenes or tumor suppressors), or are based on the expression of cancer genes. The article studies all small molecule kinase inhibitor drugs that were approved between end 2013 and mid 2018, including inhibitors of ALK, CDK4/6, BTK, HER2 and PI3-kinase. The compounds were profiled in a panel of more than hundred cancer cell line proliferation assays, the Oncolines™ panel. The cell lines in the panel originate from different human cancers and have been characterized with regard to the presence of mutations and expression of more than 300 known cancer genes. The study of Uitdehaag et al. is based on cancer cell lines, yet there is also direct clinical relevance of the results. Importantly, the authors demonstrate that the relative sensitivity of cancer cell lines represents the selectivity of targeted inhibitors for patient stratification markers as validated in the clinic. Interestingly, clinically approved biomarkers showed at least tenfold selectivity for the cancer gene corresponding to the drug label. By also including failed biomarker-based clinical trials in their analyses, the authors provide guidance for improved clinical trial design based on cancer cell panel profiling data. In total, the article contains the profiles of the seventeen kinase inhibitors on 280 biochemical kinase assays. For most of these inhibitors, this is the first, parallel and kinome-wide biochemical profiling study in the public domain. The article provides a rich resource for scientists that are active in the design and development of new kinase inhibitor drugs. Figure 1. Clustering of seventeen new kinase inhibitors discussed in article  according to cancer cell line inhibition profile (IC50 profile) in proliferation assays in the Oncolines™ panel. 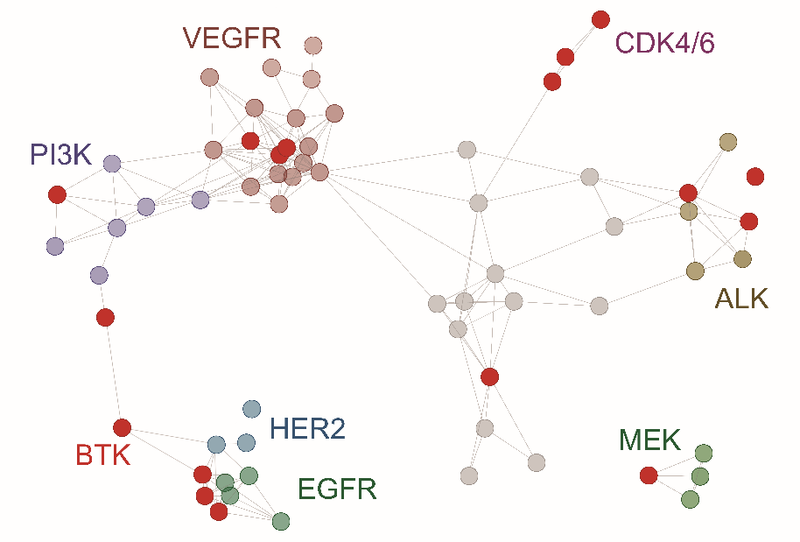 Kinase inhibitors profiled in a previous study  and anticancer agents with other mechanisms of action, but that show similarity in their Oncolines™ IC50 profile , are also included in the network tree. Affiliations: 1 Netherlands Translational Research Center B.V., Oss, The Netherlands; 2 Carna Biosciences, Inc., Kobe, Japan. PLoS ONE 9: e92146; 2014. Molecular Cancer Therapeutics 15:3097-109; 2016.